Plane Crash: Legal Advice & Post Traumatic Stress. Bloomfield Hills, MI. It Was a Late August Afternoon In 2000. I was a passenger on a private jet. We had flown in from Flint, Michigan to Brainerd, Minnesota that morning to attend a settlement conference in court. By evening, we were returning home to Michigan. The jet could seat eight passengers, but today the two pilots carried just the president of the company and me. It was an overcast, slightly rainy day at dinner time when we took off. There was light turbulence and we leveled off at about 25,000 feet before we climbed higher. We reached almost 34,000 feet. I looked out my left-side window and saw an eighty-story wall of deep black clouds in the distance appearing to gallop toward the plane. Soon, it was as if someone had turned the lights off. Everything went dark and the plane seemed to pick its way through these ominous cloud canyons amid growing turbulence. There was an eerie quiet, except for the steady drone of the engines, as we labored up to 34,000 feet. Then, out of nowhere, a blinding lightning bolt abruptly struck the left engine with explosive power. The plane shook violently and the left engine went dead. Intense rain and hail battered the plane. Within seconds, the right engine 'flamed out'. Suddenly, we were squarely in the middle of a fierce category-five storm with no engines. The plane nosed downward and I heard the pilots call into the radio: "Mayday! Mayday!" The next thirteen minutes were sheer terror. The plane jerked violently as the 75-mile per hour winds fiercely lashed sheets of rain against the windows. It seemed like the plane would not be able to withstand such extreme turbulence. I thought the metal skin of the plane would come apart at the seams. The oxygen masks popped out of the ceiling, but they dangled out of our reach because we were in a steep, spiraling nosedive. To my utter disbelief throughout this chaotic, nightmarish descent, the engines could not be restarted. Worse yet, the batteries, which run off the engines, went dead after 10 minutes. So now the cabin lights abruptly shut off and the avionics shut down, cutting off the dial readouts that help identify the location of the plane and airport. We were now "dead sticking" toward a landing site we could not find at a very great rate of speed. At 3,000 feet, there was nothing but dense wilderness as far as the eye could see. Then the pilot told us to put our heads between our legs and brace ourselves for a crash. We hit the trees with such force that the pilot and co-pilot were killed instantly. The cockpit dove deep into the earth. 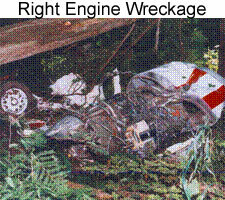 The plane tore apart from the impact and the fuselage section that contained the two of us separated and somersaulted into another set of trees further down the rocky ravine. I was drenched in jet fuel, hanging upside down by my seatbelt. I had fractured or broken many bones and I could hardly breathe. We crawled out of the wreckage and made our way to a huge fallen tree some thirty yards away. Unbeknownst to me, we had crashed into a remote and rugged section of the vast Ottawa National Forest. We had missed Lake Superior and Chippewa Falls by just a few miles. The nearest road was a backwoods, two-track 'trail', and even that was two miles away. Night fell quickly and the deathly silence was interrupted by the yelping of coyotes and wolves in the distance. As dawn broke, I limped through the debris field to the fuselage, looking for paper to try to make a fire. I was amazed to find my cell phone, undamaged, in the wreckage. More incredible, I was able to get a signal. I dialed 911, which connected me to the dispatcher of the local Sheriff's Department. By the afternoon, I was patched through directly to the pilot of a life-flight chopper who I helped guide up the river to our crash site. It took the ground rescue crews almost an hour to reach our location. Finally, that afternoon, we were airlifted out of the river and taken to the emergency room of the local hospital. Copyright 2005 by PlaneCrashSurvivor.Com. All rights reserved. Since that fateful day, there have been plenty of ups and downs. But along the way, I have uncovered many genuinely useful resources and have met some extraordinarily helpful people. Perhaps my own journey wrestling with these problems and the knowledge and experience I have acquired along the way can be of benefit to you. This website is here to help you find the resources and knowledge you need to assist you in helping you through your own airplane crash experience. If you think you may be suffering from post traumatic stress or you are not certain about what you can do to help yourself or someone close to you, please feel free to call us.We can provide you with helpful free information regardingphysical and emotional issues, legal and insurance problems and access to all kinds of helpful support groups.